The case for island energy has never been stronger as key decision times come around. The Orkney Renewable Energy Forum (OREF) believes that 2018 will be a critical year for renewables in Orkney with major decisions locally and nationally set to determine whether and how the many benefits and achievements of the last 30 years are going to continue. These benefits have included hundreds of local jobs, thousands of visitors, millions of pounds in energy revenues and around ¾ billion pounds in energy related investment. The scale and breadth of the endeavour has meant that Orkney is one of the first communities in the world to generate over 100% of its electricity use from renewables; it has led technological advancement in wind, wave, tidal, energy storage and hydrogen; and through employment, community projects, micro installations, energy efficiency measures and local investment the direct benefits have already reached a large number of Orkney households. Vitally such developments have also sought to balance a range of planning considerations that affect people, wildlife, heritage and landscapes as well as the economy. It is against this background of major success that over the last 12 months OREF has been working for the adoption of policies and strategies at local and national levels that will allow Orkney to consider how best to continue to benefit from such sustainable energy initiatives whilst appropriately safeguarding key aspects of Orkney’s heritage. This can be a delicate balancing act, but in a place that was proud to host the world’s largest wind turbine during the 1980s and 90s and to host the world’s largest and most successful wave and tidal test centre in the 2000s and 2010s, this seems to be a challenge that Orkney has been willing to explore and prosper by. 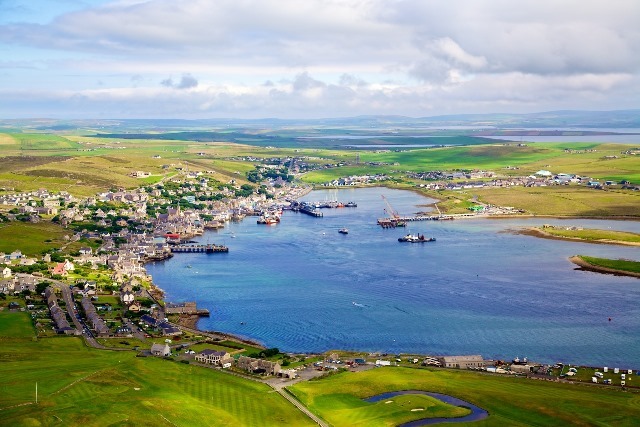 One area of focus for OREF has been to work with OIC and other stakeholders to develop a sustainable energy strategy that sets out a framework for decarbonising the remaining 80% of Orkney’s energy use that is currently not electrical or renewable. There is clearly a significant job still to be done in that regard and further local renewable capacity will be needed to achieve self sufficiency. Another area of focus has been to increase awareness of the critical stage that has been reached with regards to the possible new transmission cable connection. A ‘Needs Case’ is currently being scrutinised by the grid regulator Ofgem who need to see a viable pathway for future generation capacity if Orkney is to be transmission connected. The recent challenges for the marine sector have placed even more focus on the potential for onshore wind to provide a backbone of this capacity with marine expected to make use of any connection that is made. Although there has been no formal response from Ofgem, as yet, it is understood that 70MW of new committed generation will be required to secure the transmission connection. The challenges for achieving any such capacity are considerable and include, planning issues, timing of grid availability, grid securities, grid use of system charges as well as winning a favourable tariff through government support mechanisms (eg Island CfD) or running ‘subsidy free’. These obstacles will need to be negotiated by any proposed wind, wave or tidal development and will require much greater operating and cost efficiency than has been achieved to date. Re-establishing support from the UK government for island energy will also be necessary to help with a number of these issues and so OREF has also been engaging with key politicians at Westminster and here in Orkney. During the winter and the spring, OREF delegations travelled to Westminster to present the case for Orkney Islands energy. Then at the beginning of August, Lord Ian Duncan, Parliamentary Under-Secretary of State for Scotland, visited Orkney to see first- hand how Orkney can play a leading role in the UK Industrial Strategy. This was followed in August, by Lord Henley, Parliamentary Under-Secretary of State at the Department for Business, Energy and Industrial Strategy, who also visited Orkney and met with OREF and individual renewable companies, who underlined the important role Orkney can play in the sustainable energy sector. In addition the renewable energy expertise and supply chain which Orkney offers the UK and exports globally was discussed, along with the world leading research and test centre facilities which together contribute to Orkney’s reputation as a ‘living energy laboratory’. There are clearly some major choices to be made and decisions to be taken during 2018. The foundations for Orkney’s sustainable energy future have been well laid and have proven to be overwhelmingly beneficial to the islands. OREF hopes that this progress can be maintained and built upon as the environmental challenges of climate change and the economic challenges of BREXIT continue to grow.